While many writers influence society, few if any, impact modern political thinking more than Aldous Huxley and George Orwell. Born only nine years apart, both men grew up in the pre-World War I British Empire. Moreover, Huxley, for a short time, taught French at Eaton College to a young Eric Blair who later took the penname George Orwell. From this point on, their lives moved in cycles of circular motion rather than parallel, at times agreeing, at others times diametrically opposed. Both men wrote about social injustice of sorts but approached it from differing directions. In Orwell’s mind, government controls society in a totalitarian fashion. In fact, the quote “big brother is watching” comes from his novel 1984. Huxley, on the other hand, sees personal liberties eroded by a society jaded and overwhelmed with excess exposure and stimulation of unimportant issues. Perhaps, in the end, we will find both are true with the multinational, multicultural society we have today. 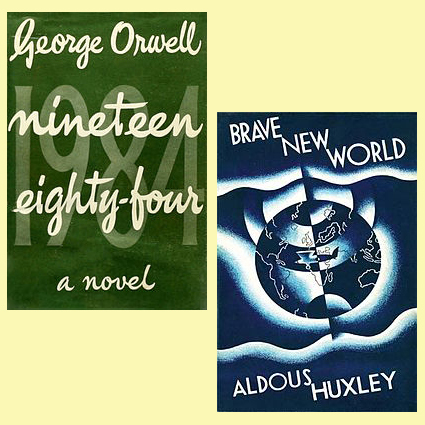 It is common today to see comparisons of Orwell’s 1984 and Huxley’s Brave New World boiled down to Orwell fear of a government that bans books and Huxley’s fear of a society that chooses not to read them. While in a broad sense the comparison is true, it does lend itself to Huxley’s fear of people whom cannot be bothered with knowledge in-depth and satisfy themselves with the cursory. In truth, both theories are intertwined and simply different parts of a larger perplexity. That is, we as a society are satisfied with filling our minds with stupidly numbing trivia, all the while our freedoms erode. It is the modern-day equivalent to Nero fiddling while Rome burned. We are more interested in who Arnold Schwarzenegger screwed over a decade ago than the very serious issue of our national debt, or the wars we are fighting overseas. Perhaps we are well on the way to the world Orwell predicted in 1984 and it is with the compliancy Huxley points out in Brave New World used as the roadmap. For a government to control its citizens, as in 1984, they must be pacified. Nazi Germany pacified its citizens through fear and intimidation but their primary passivity stems from a post-World War I government that simply degenerated into chaos. This chaos created apathy and set the stage for a government with totalitarian goals. With a different set of particulars, are we not on the same road today? In Orwell’s thinking, such a government keeps the truth from its citizens. In Huxley’s thinking, there is no need as its citizens are only interested in the superficial. For instance, when the Cable News Network (CNN) began in 1980, it started the 24-hour, continuous news cycle. As other broadcasters followed, competition required stations to via for ratings and advertising dollars. Soon, daily news was more about keeping viewers with entertainment than news itself. Soon, the line between the two blurred and now a valid news item becomes mixed with trivia and intrigue. We no longer see the difference and our government freely hides information we need within the background noise we don’t. We are setting the stage for an apathy that will allow our government to steal our freedom as easily as pickpocket unknowingly steals a wallet. By the time we figure it out, the wallet of freedom is long gone. That is not to imply some vast conspiracy on the part of governments or corporations. No, it is our own unwillingness to seek information in-depth and question what we see that drives us to fulfill this Orwell-Huxley future. If we watch shows like Jersey Shore instead of 60-Minutes, we will see more shows like the former and even the latter will change its format to include such fluff to remain relevant. That is not the fault of government or broadcasters. It is our fault; it is societies fault. When we wake up and find an Orwellian government in place, it is because we now live in Huxley’s view of society. We need to step back from our over-stimulated, under-informed lives and demand more from our government and news organizations in the way of valid information. Otherwise we will go beyond Orwell’s bad dream and enter a Kafkaesque nightmare.